Saree blouse designs play an important in the saree’s overall appeal. No matter how beautiful a saree is, an imperfect blouse model can ruin the look of your saree. The beauty of the saree accentuates only when it is matched with an appropriate blouse pattern in a perfect fit. South India Fashion lists best blouse models, blouse styles, blouse patterns and designer blouses. A gorgeous saree is nothing without a suitable blouse to accompany it. Blouse style play an incredible role in determining the overall look of a saree style. Indian sarees can be mix and matched with different types of blouse patterns. One can achieve a different look each time by teaming a saree with different types of blouses. 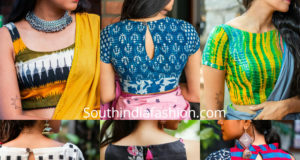 Southindiafashion.com is a one stop blog that features a variety of latest blouse designs collection. Navigate through our "Blouse Designs" category to find thousands of latest designs catalogue including designer blouses, pattu saree, silk saree, maggam work, kutch embroidered blouse, cotton saree, chiffon blouses, Boat neck blouses, high neck blouses, elbow length sleeves blouses, sleeveless blouses, full sleeves designs, cap sleeves blouses, noodle strap blouses, halter neck designs etc. There are several trendy blouse back neck designs images like u-shaped back neck, cut out back neck designs, deep back neck designs, patch work blouses, collar neck designs etc. There are front open blouses, back open blouses, side zip blouses and many more styles. We have thousands of designs for plain sarees, printed sarees, chiffon sarees, georgette sarees, silk sarees, kanjeevaram sarees, pattu sarees, banarasi sarees, cotton sarees and more . Experiment with modern blouse neck designs to create a stylish look for parties and special occasions. Online shopping can save you the stress of dealing with shopping at malls and worrying about stitching etc. There are a huge number of ready made contemporary, traditional and designer blouses that are available online. We have given you the links to the best latest ready made saree blouse designs in our " Online Shopping " section, so that you can shop from your home.